Everyone loves Victor Garber! On Wednesday night, the award-winning Canadian actor made an appearance with his Hello, Dolly! co-star, Bernadette Peters, on Bravo’s Watch What Happens Live and answered questions from fans. While we love that incredible Irish accent he pulled off in Titanic, many fans really want to know more about Victor Garber’s husband, Rainer Andreesen. Keep reading to find out more! He may be known as Victor Garber’s husband, but as an artist and model, Rainer Andreesen has a celebrity fan following of his own. Andreesen sold his works of art to Hollywood superstars such as Ben Affleck, Jennifer Garner, Whoopi Goldberg, and more. He also modeled for a few luxury brands. 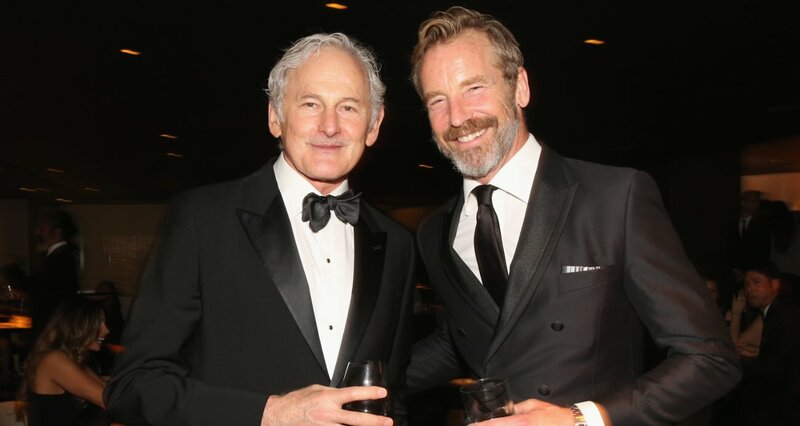 Keep reading if you want to know more about Victor Garber’s husband. We have all the details you need to know, right here, in Rainer Andreesen wiki. Andreesen shares his Canadian roots with Garber, but is from the west while his husband grew up in London, Ontario. Born in 1963, in Prince Rupert, British Colombia, Rainer Andreesen’s age is 55. He now spends most of his time in New York and Los Angeles. Seeing his immense talent, Rainer Andreesen’s family encouraged him to pursue his love of art from a young age. He pursued an arts and design program at Capilano College in Vancouver and graduated in 1986 with honors. After graduating, he went on to open a design studio. He then got into modeling after a fashion photographer encouraged him. Andreesen spent a few years in Europe after being recruited by a modeling agency based in Milan, Italy. He modeled for international brands such as Giorgio Armani, Valentino, Zenya, and Hugo Boss. With those handsome looks, that’s not too hard to believe! After returning from Europe, Andreesen continued his artistic journey in New York and Los Angeles. His inspirations include artists like John Singer Sargent, James Whistler, Rembrandt, and others. His artwork is owned by celebrities like Jennifer Garner, Alfred Molina, Rosie O’Donnell, and many more. Check out this amazing portrait of Victor Garber on Rainer Andreesen’s Instagram. Head over to his page to see more of his gorgeous artwork. Also Read: Marco Perego Wiki: This Italian Artist Is Zoe Saldana’s Husband! For a long time, many fans wondered if Victor Garber was gay, but the actor rarely spoke about his private life. Garber’s relationship with Andreesen became public during a 2013 interview with Greg Hernandez. Keeping Secrets Is Not His Forté! There is no doubt that Andreesen is a big supporter of his husband’s work, but even he couldn’t keep a secret when it came to Garber’s casting in Hello, Dolly! According to reports, Andreesen let the top secret news of Garber’s casting slip out in September 2017 while commenting on an Instagram post. The comment was later deleted, but not before hawk-eyed fans spotted it and shared it all over social media! Fortunately, Rainer Andreesen’s slip up did not affect Victor Garber’s Hello, Dolly! appearance, as he stole the show with his amazing performance in the Broadway hit.